SR, (Sakae Ringyo) has made a great reputation for itself with it's 27mm tall Low Fat series mountain pedals. 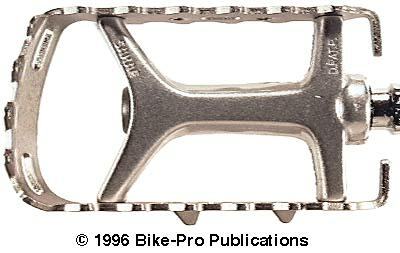 The pedal is over 100mm wide for full foot contact, with a shark toothed cage and toe clip compatibility. The body of the pedal is made of forged aluminum, that's polished in a rotating barrel with liquid polish to smooth all the external surfaces. The braces on the body, that hold the cage have rectangular slots through them for toe straps, with enough space between the rear braces for the toe strap to be twisted, holding it in place. Into the body a black steel bearing cup is pressed at each end. The outer bearing has ten 3mm diameter steel ball bearings, while the inner bearing has thirteen of the same ball bearings. The bearing races can be adjusted. The spindle is made of chrome plated, heat treated Boron steel, with a 6mm allen fitting on the thread end to simplify installation. The cage is made of die-cut steel painted Black, then riveted to the body. The cage has shark teeth on it's edges that rise sharply on the inner side then slope down to the outer side. The cage has cut outs for toe strap to pass through, a double tanged toe flip at the back, and holes for toe clip and reflector mounting. The Low Fat has a rubber seal on the spindle for the inner bearings and a tight fitting Grey dust cap covering the outer bearings. A pair of the 126 model Low Fat pedals weighs 418 grams, the body is Silver and the cage is Black. These were made in Japan, but SR disappeared with Suntour when they went out of business in 1994. we sold these for $18.99 a pair. The SR MTP 127 is also known as the Low Fat LTD pedal and is the next step up in the Low Fat series of mountain bike pedals. Everything about the pedal, except the cage, is the same as the 126 - materials, style of manufacture, bearings, and seal. The cage on the 127 is upgraded to a die cut aluminum alloy cage that is shaped, then Black anodized. The cage is not quite as long as the 126, roughly 1 or 2 millimeters shorter, but has the same shark toothed top, double toe flip tab, strap passage end. It will accommodate reflectors and toe clips. The holes for the toe clip bolts on the front of the cage are threaded with 5mm x .8mm thread pitch so the bolts will fasten toe clips to the cage without the added weight of the steel nut at the back. The cage is riveted on and the bearings are adjustable. The body is Silver and the cage is Black, with the pair weighing 326 grams. These were made in Japan, but SR disappeared with Suntour in 1994. We sold these for $25.99 a pair. The MTP 129, known as the Low Fat Comp, is the top of the Low Fat line. These pedals use the same body, bearings, spindle, and dust seals as the previous two models. The body of the 129 pedal is more highly polished, giving the cast surface a smoother satin appearance. The 129 uses the same cage as the Low Fat LTD, but on the 129 it's hard anodized to a Titanium Grey color. The cage is held onto the body with four nickel finished screws that have a 3mm allen head fitting. At the end of each of the braces, is tapped for the four cage mounting bolts. The cage, if it is damaged would be replaceable, but we have never seen, nor does the SR catalog list, the cages as available separately. The grease used in the bearing assemblies on the MTP 129 pedals is considerably more viscous than the grease used in the 126 or the 127 pedals. The body is Silver and the cage is Grey and the pair weighs 333 grams. These were made in Japan, but SR disappeared with Suntour in 1994. We sold these for $29.99 a pair.